To kick off our new "Take Out" column, we attempt to coax the workaholic pastry wizard into a deep sleep and probe the depths of his dessert-laden subconscious. Welcome to Take Out, a new column where writer Sophie Brickman (@sbrickman) takes chefs, bartenders, and restaurateurs out of their normal environments for a day on the town. On a recent Saturday afternoon in midtown, Dominique Ansel, inventor of the Cronut™, was curled into the fetal position on a firm-tensioned 2000T Hästens mattress, the pallet of choice for the King of Sweden. It costs $37,200. Across Hästens’ East 58th Street showroom was the Ferrari of all mattresses, the Vividus, which takes 160 hours to make by hand and runs a cool $108,000. After shifting from side to side a few times, Ansel shoved his hands under his cheek for support. I dream about pastry. In a dream, you can swim in marshmallows! Ansel rarely gets more than four hours of sleep a night, and sometimes functions on as little as two. He’s up at 4am each day and plows through the next twenty hours, greeting the lines of Cronut™-hungry masses that start forming in the wee hours, baking, hawking his pastries at countless events, training employees, doing the pastry paperwork inherent in running a business, dreaming up new confections, and working on his upcoming book at home late at night. We figured Ansel could use an afternoon of deluxe sleep, though he claims not to feel particularly exhausted. Born and raised in France, Ansel began apprenticing to local bakers after high school, eventually going on to spend seven years at Fauchon—where he helped the Parisian gourmet food company expand to Russia, Kuwait and Egypt—and six at Daniel in New York City. He opened his own pastry shop in SoHo in 2011, and this year, won the coveted James Beard Award for “Outstanding Pastry Chef.” On the menu now are myriad playful, creative desserts to rival the Cronut™, from the Cookie Shot—a shot glass made of cookie dough, served with vanilla-infused milk—to the Frozen S’More, a chewy ice-cream confection that’s torched to order like its eponymous campfire treat. 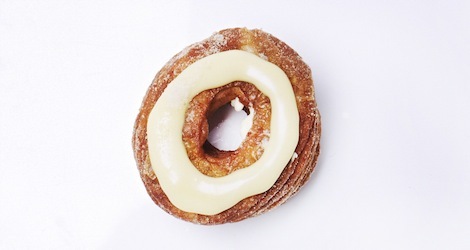 Do you dream of Cronuts, chef? A pool of marshmallow fluff is not yet on the summer menu, but one menu hit, his “chocolate caviar tart,” came straight from a deep REM stage. Sleeping gives you courage. When you wake up and have your full energy, you are not scared of anything. A few minutes later, Ansel walked into a midtown office building, took the elevator to the 12th floor, and got out at YeloSpa, which specializes in deluxe power naps and, according to the receptionist, is a frequent stop for midtown businessmen who need to take a break in the middle of the day. Robin Hood-esque lute music tinkled over the sound system. After signing in, he was led into a special sleeping room, snuggled under a cashmere blanket, and tilted back at a 25-degree angle to the floor—the spa’s special “zero gravity” sleeping option. The lute music changed to underwater Mario Brothers, then what seemed to be a xylophone version of “Welcome to our World of Toys.” About 20 minutes later, an artificial sunrise gradually lightened the room, and Ansel returned to the reception area looking mostly unchanged.